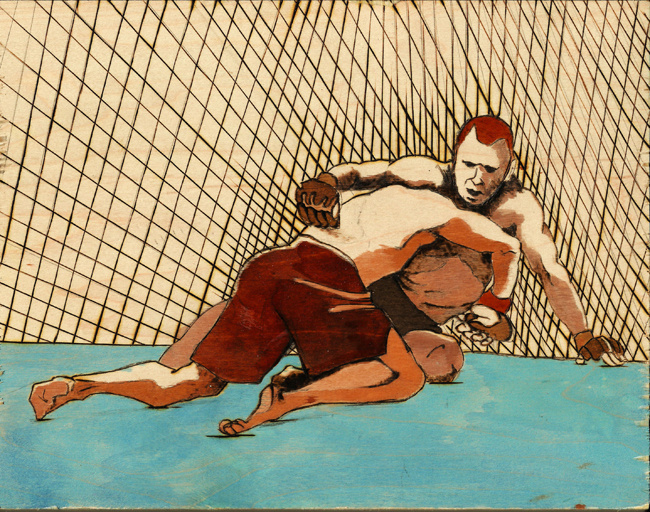 Just a few weeks ago we wrote that Chris Leben’s refusal to come out for the second round of his fight with Uriah Hall at UFC 168 after taking a bad beating at the end of the first showed a level of “soul searching and self-actualization poets could only dream of.” In a sport of tough guys (and Leben is among the toughest), where reputations are made as much on self-destructive stubbornness as victories, Leben’s willingness to look at himself in that quick minute between rounds and admit his new place in the world was a minor miracle. “I’m done,” he told his cornermen, and then walked over to Hall and told him, “You’re the next generation.” Mixed martial arts, the sport Leben helped drag into the mainstream (by way of his star turn on the first season of The Ultimate Fighter), had passed him by and he knew it. It’s a fascinating thing: to admit not only that your physical limitiations are keeping you from competing in a sport but that your emotional development is doing so as well—that your inabilities can be the result of a positive development, not just a negative. I don’t know how many fighters these days feel like they need to have a mean streak to fight professionally (I’m guessing many fewer than did when Leben started and MMA was much more about the will to fight than the ability), but it’s remarkable to think of a sport as being something one can grow out of emotionally. The very thing that made Chris Leben a great fighter was killing him as a person (witness all the DUIs and failed drug tests), and the very process by which he was able to attain a semblance of happiness in his life wiped out his ability to compete in the sport he loves. One period ends and the next begins. How often do you hear that kind of happy ending in the world of professional sports?